Khaseem joined Morood Investment Company in June 2013. With over 16 years of experience in audit and finance for real estate and private equity investments, he is responsible for accounting and financial management, tax and zakat planning, investment transaction support and portfolio monitoring, investor reporting, risk management and regulatory reporting of the group. 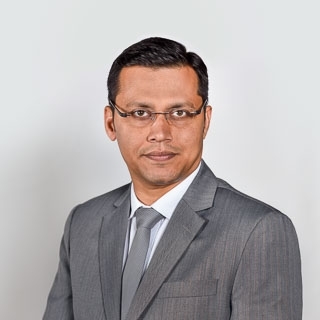 Prior to joining Morood Investment Company, Khaseem worked as a Finance Director in Inovest BSC, Bahrain and held the position of a Chief Accountant in Tala Property Development, Bahrain. Khaseeem is a CFA Charterholder, a Chartered Accountant and a Certified Financial Risk Manager. He holds a Bachelor’s degree in Commerce from Gulbarga University, Karnataka, India.